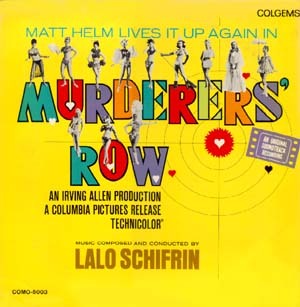 Murderers' Row is one of the soundtracks released on the Colgems label. With music composed by Lalo Schifrin, the LP accompanied the film, one in a series of Dean Martin vehicles where he played Matt Helm, a sort of cross between James Bond and Foster Brooks. This soundtrack is long out of print. Here is its main title tune. Just copy this address into your browser, and you will be transported back to a time where secret agents were all the rage, and every actor worth his salt wanted to be one. As I mentioned in an earlier post, there are very few legitimate Colgems re-releases on CD, but there are plenty of gray market, or bootleg, rereleases. These boots exist because other than The Monkees, you really can't get Colgems releases in any other way. 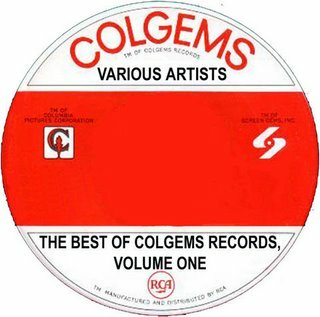 If you contact me off the blog I can tell you how you can get your own Colgems Best Of recordings--there are actually two at the present moment. And better yet, I can tell you how you can get these two CDs for FREE! Now is the time for a disclaimer: nothing posted here is intended to infringe on any copyright. If they are found to infringe on any copyrights, they will be removed. Now that that is out of the way, if you want Colgems, I can tell you how to get Colgems; drop me a line. Paula Wayne recorded several singles for Colgems in varying styles, but who in the world is Paula Wayne. I at first thought that she was African American, based on her role with Sammy Davis, Jr., in "Golden Boy" (pictured) on Broadway. But further investigation shows that she was Caucasian. I only bring this up as a point of reference--it shows what I know. Anyway, she also appeared in several other Broadway productions, including "Best Foot Forward" with Liza Minnelli. After several Broadway appearances, this singer/actress appeared to fade off the face of the earth. Her Colgems output took her into varying styles of pop, everything from Petula Clark-sounding numbers to more introspective tunes. Try this one with the link that I have supplied: "Yours Until Tomorrow." If anyone has any further information on this artist, please send it my way. Of all the Colgems artists, she is one who I can't find very much about, which makes me even more curious about her than I normally would be. Why No Colgems Releases On CD? This is a very good question to which I don't have an answer. Obviously, the recording career of The Monkees has been well documented by Rhino Records. When Colgems went kaput, I assume the masters to this material went to Bell Records, later to Arista Records, and now might be in the hands of Warner Brothers. Colgems releases have turned up here and there. Besides the Monkees, The Lewis and Clarke Expedition's "I Feel Good (I Feel Bad)" has surfaced here and there, and this year saw the rerelease of the "Oliver" soundtrack in a package that included not just the music, but the classic film itself. Beyond that, I have absolutely no idea why these tunes have not turned up on legitimate CDs. Home-made CDs are another story, and yes, that is another story for another time. 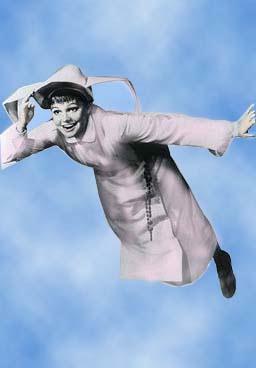 One of the dopiest, but beloved shows of the 1960s was ABC's "The Flying Nun" starring Sally Field. Moving from the beach of "Gidget" to a convent, Sister Bertrille was able to fly when a gust of wind kicked up under her headgear. Based on the book by Tere Rios, the show was ridiculous, but it was so well done that you absolutely had to love it. Colgems picked up on the popularity of the show and Field with one album of songs and a couple of singles. None really clicked, although "Felicidad" (#94, 1967) did reach the Billboard charts. The series has just been released on DVD. The album has never been rereleased. Here is a tune off the album, "The Louder I Sing (The Braver I Get)." You can cringe if you want. But just think, this is Sally Field several years before Norma Rae made her an actress to reckon with. Go with it. 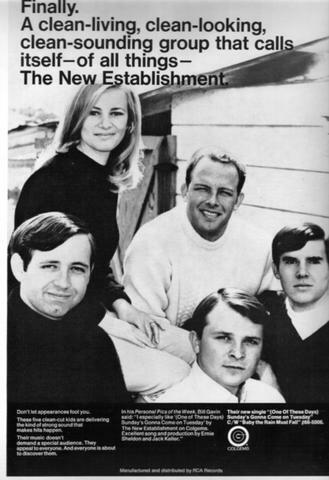 The New Establishment was one of those clean cut groups that dotted the pop landscape in the late 1960s. Their songs were kind of folky rock, but as whitebread as you can imagine. Their most popular song, at least on the Billboard charts, was "(One of These Days) Sunday's Gonna Come On Tuesday (#92, 1969), but they are also remembered for being one of the slew of artists who recorded the "Seattle," the theme song for ABC-TV's "Here Come the Brides" TV show. This is my first experiment. I am going to try to insert a link here of their "Baby the Rain Must Fall" song, which was the flip of "... Tuesday." Let's see if it works. 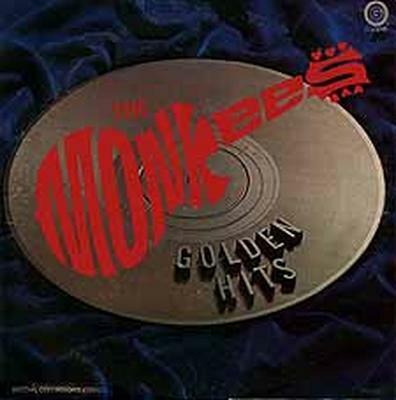 In addition to The Monkees, Colgems produced a number of soundtracks during its short history. Here is one of them, perhaps not its most popular, but a viable soundtrack nonetheless. Just for the record, other than The Monkees first four albums, the label had only one other number one album--the soundtrack to the Oliver film with Ron Moody, Jack Wild and Mark Lester. I am still trying to figure out this thing, but in the meantime, I wanted to post one of the rarest of the Colgems albums. This was put out in conjunction with the Monkees cereal box records. Yes, it is pretty cheap looking. I think you could send away for it from Post Cereals. It was tied in with the show's run on CBS in the late 1960s. I have no idea if music files can be loaded on this site. If someone can help me with an answer of some tips, let me know. Please give it a shot. I think you might like it. And again, if anyone can give me some direction about adding music to this blog, I would appreciate it. OK, I am playing around with what I have and what I can do, and I decided to try loaded a photo onto the blog. 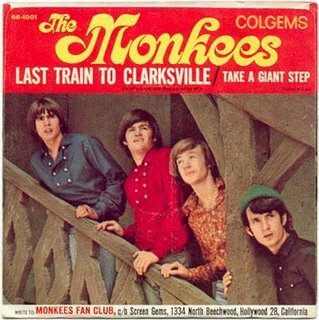 This is the first Colgems record, The Monkees' "Last Train to Clarksville." There are several variations of the picture sleeve, including a black and white version. This is one of the variations. Let's see if I did this correctly. Colpix Records was born in 1958, headquartered in New York City. The label was a division of Columbia Pictures Corporation and much of their output consisted of soundtracks from Columbia Pictures movies and television shows. 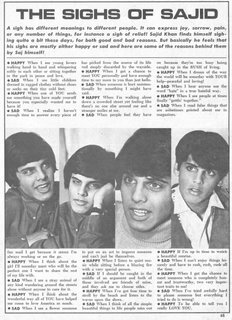 Colpix also became the outlet from which several younger stars from the top television shows of the day recorded. Among them were Donna Reed Show teen stars Shelley Fabares and Paul Peterson, who had some mild success while at the label. Future Monkees David Jones and Michael Nesmith also recorded for Colpix, with Jones releasing an album and a few singles on the label. Nesmith recorded under the name Michael Blessing. This Monkees connection was further cemented when Don Kirschner entered the scene. In 1965, Columbia Pictures purchased Don Kirschner's publishing company, Aldon Music, and their in-house label, Dimension. Colpix eventually ceased activity in 1966. Screen Gems, which was Columbia Pictures' television production arm, formed an association with RCA and started the Colgems label in fall 1966. The Colgems label (the name is a contraction of Columbia and Screen Gems) basically replaced Colpix, and followed the same path: releasing both soundtrack albums from Columbia motion pictures and singles and albums from some of the most popular teen stars of the era. The difference was that Colgems actually created its own star attraction, The Monkees. With Kirschner at the helm, Nesmith, Jones, Peter Tork and Micky Dolenz were shaped into a musical group, appearing on their own TV show on NBC from 1966 to 1968. Colgems released both albums and singles from the "Pre-Fab Four," and sold millions of records, starting with "Last Train to Clarksville" and the first Monkees album. Using this clout, the label expanded its reach. With The Monkees as its backbone, Colgems handled recordings from a diverse number of acts, including Hoyt Axton, Sally Field, Sajid Khan, The Lewis and Clarke Expedition, Rich Little, and several other performers. It continued to release soundtracks, hitting paydirt with the Oliver soundtrack in 1969. Although The Monkees TV show went off the air in 1968, a Monkees unit (less Tork and later Nesmith) continued to release albums and singles into 1969 and 1970. When The Monkees basically petered out, the label did too. For all intents and purposes, Colgems Records shut down for good in late 1970/early 1971 or thereabouts. 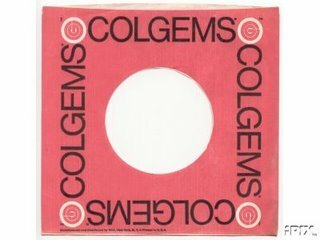 Colgems, or what was left of it, morphed into Bell Records, which itself was absorbed into Arista Records in the late 1970s. Even though the Colpix/Colgems/Bell/Arista affiliation is a good one, few of the original Colgems releases-excluding The Monkees catalog, one or two Lewis and Clarke Expedition tunes and a few soundtracks-have been rereleased, first on vinyl and now on compact disk. This makes the label even more fascinating, as most of the music on Colgems has not been heard in more than 30 years. Promo only single, presumably released in 1967. (Note: A promotional 12 inch single, which many claim was the first ever released in this format, is said to have been released to promote the Casino Royale soundtrack. Dusty Springfield's "The Look of Love" was on this single; I don't know if it was the same on both sides (perhaps stereo/mono) or if there was a "B" side to this release. Several group members claim that this is a recent bootleg, and not part of the original Colgems releases. This is the Colgems Records Blog. If you are a fan of The Monkees, then you know what Colgems Records was--their own label, sort of a boutique label from RCA that was used to showcase the work of this TV-created group. However, the label became so much more. It featured many acts, including The Lewis and Clarke Expedition, Jewel Aikens, Quincy Jones, Sally Field and Sajid Khan. 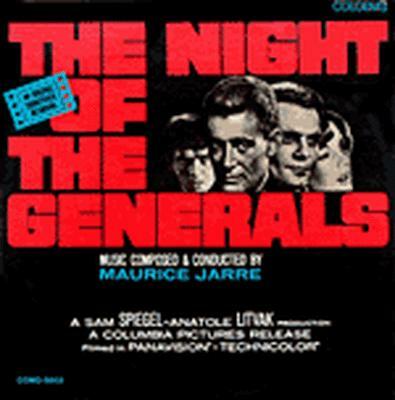 In addition, many soundtracks to popular films of the time were released on this label. Right at the moment, I don't exactly know my plans for this blog, but I hope to have something formulated in due time. Check back regularly. I am sure you will enjoy what is eventually featured here.